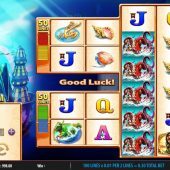 Neptune's Quest slot is a kind of hybrid of two different WMS games, the famous old Money Burst slot Bruce lee and Neptune's Fortune. It uses the forerunner to the Colossal Reels games such as Kiss i.e. the small 2x2 first reels followed by larger ones but here we get a variation of the idea as I'll explain. The reels are set over a cartoon undersea world with some quiet spooky music as we spin and some gentle tinkling as the wins count up but it's pretty basic looking overall. Will Neptune be dragging our bankroll down to the depths of the ocean here or will he help us stay afloat? If you recall the Bruce Lee game you have a 2x2 grid of 4 individual reels to the left and 3 reels of 4 symbols to the right with 60 paying lines. On Neptune's Quest there are two 2x2 reel sets to the left and 3 reels of 6 rows each. Each set of 4 is the initiator of 50 paying lines so there are 100 in total. Octopus Wilds can appear on the 2x2 single reels and stacked on the tall reels 3, 4 and 5. 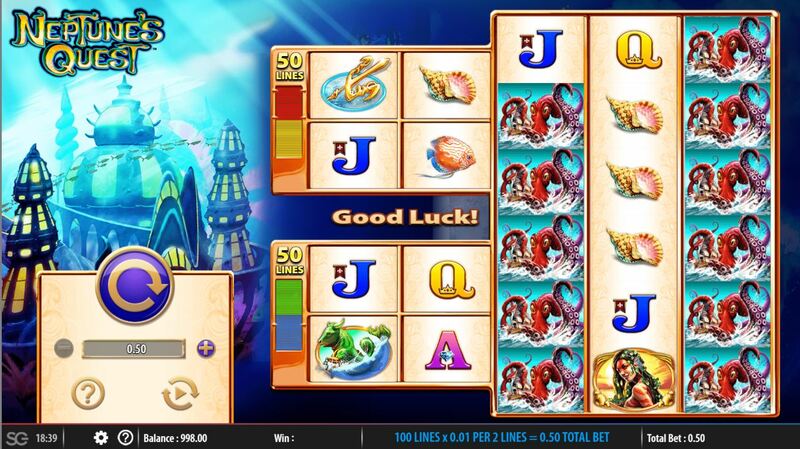 These are the best 5-of-a-kind pay at 5x your 50-coin bet the same as Neptune himself, with Mermaid or Water Bull 150 coins, Trident or Fish 100, Shell or Starfish 75 with four card values at 40 each. As with this type of game there are two possible bonus rounds and they can on rare occasions combine for a third! The first type is 5 free games triggered by any 4 identical symbols in either one or both 2x2 grids. These will stick in place for the duration and the 2x2 grid that didn't trigger them will then consist of colossal 2x2 symbols only. Their are more stacked Wilds on the 3 bigger reels during these to increase win chances. The second is triggered by 3 Undersea World scatters on reels 3, 4 and 5. You get 5 spins which can retrigger and you get more stacked Wilds on these reels so any wins are dependent on a match in the first and second column of the 2x2 grids which again you'll see every spin as they are made up of 2x2 symbols. The ultimate and very rare third free spins round is to trigger both simultaneously. You will then see 20 free games with 2x2 colossal icons spinning on the small grids and lots of stacked Wilds appearing on the large 3 reels for some big totals plus you get 100x stake for triggering it in this manner. Don't expect those multi-thousand times bet returns though that Bruce Lee would usually produce - the pays are very much lower here!